On Saturday, Feb. 18, 2017, a group of concerned students released a video which presented concerns regarding race and racism at Andrews University, and included specific requests for a response from University administration. Since the release of this video, several steps have been taken, including conversations between students and administration and forums for employees and students. The following video was released in response by University Administration and was shown to students, faculty and staff in chapel on Thursday, Feb. 23, 2017. If you have questions or concerns that are not addressed on this page, you can write to President Luxton directly at president@andrews.edu. Prior to the above video being shared with the campus community, President Andrea Luxton spoke for the chapel event. The live recording of her presentation can be viewed below. In an undergraduate chapel presentation and video shared on the Andrews University campus and through social media on February 23, Andrews University affirmed a series of commitments and next steps in response to the questions raised in an #ItIsTimeAU video released on February 18. Additionally, some of these issues were also discussed in a speech of apology and reconciliation that was made by President Luxton on October 1, 2016, at a Lake Union Conference "A Journey to Healing and Understanding" event held in Berrien Springs, Michigan. Andrews University will immediately begin a search for a full-time, senior-level administrator of diversity, a new cabinet-level position that reports directly to the president and will drive meaningful, visible and ongoing change. The plan is for this position to be filled by the beginning of the 2017–2018 school year. This senior-level administrator of diversity will develop and implement a revised and expanded cultural diversity training program. This training will be required and specialized for each group on campus: faculty, staff and students. Andrews University will continue to diversify our faculty, staff and administration in order to assure a high-quality education that prepares our students to serve meaningfully in a global environment. Our curriculum should also clearly reflect and educate students about our diversity. Regular online and campus reports will confirm progress towards these goals. Andrews University will have a strengthened grievance process that allows students to simply and directly report injustice and mistreatment of all kinds and to seek resolution. Andrews University will commit to honor, support and celebrate all the ways we seek and achieve community—including how we gather and worship together throughout our University family. Faculty, staff and the campus community will be encouraged to understand, respect and honor all the ways we worship. Download a PDF version of "Our Commitments"
On July 6, 2017, President Andrea Luxton announced that Michael Nixon has accepted the invitation to serve as Andrews University’s first Vice President for Diversity & Inclusion. He will begin in this position on August 1, 2017. 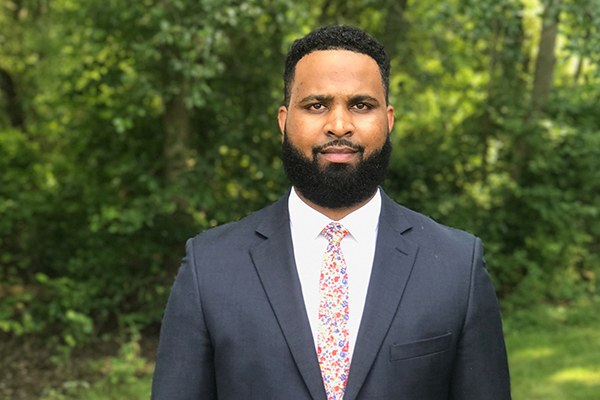 Nixon, an Andrews University alumnus and graduate of The John Marshall Law School in Chicago, was offered the position after a formal search process, which took place over the last two months on the University campus. The search committee was made up of 13 members, all Andrews University administration, faculty, staff and students, and chaired by Luxton. The committee ultimately conducted in-person interviews with five of the applicants for the position, followed by presentations to the campus community in late June by the two finalists. During their campus visit, the finalists for the position also met with University administrators and leaders from the Lake Union and Lake Region Conferences of Seventh-day Adventists. For the full story of Nixon's appointment, see Andrews News. To hear Nixon's story in his own words, visit Stories of Andrews. Koinonia is the Greek word for fellowship. It is embedded in the Pentecost story where 3,000 people were baptized in Jerusalem. New members devoted themselves to the apostles’ teachings and the fellowship. The Bible says everyone was filled with awe. In early March 2017, Spiritual Life Committee was discussing next steps for the campus following #ItIsTimeAU, and Koinonia Day was born. On this special Sabbath, New Life Fellowship, a historically black congregation which regularly meets in the too-small-for-them Seminary Chapel, and the historically predominantly white congregation of Pioneer Memorial Church, swapped worship spaces for the second church service that morning. Everyone in each congregation: musicians, preachers, deacons and regular attendees, all experienced their regular worship service—just in a different space. Read about and see pictures of Koinonia Day. In response to President Luxton and Andrews University administration, the students who helped produce the original #ItIsTimeAU video in February wrote an open and formal letter regarding the University's "It Is Time: Listen. Dialogue. Change." initiative. The full content of that letter, delivered to President Luxton and Provost Arthur on April 10, 2017, is below. The #ItIsTimeAU Team stands in solidarity with President Andrea Luxton, Provost Christon Arthur, and Andrews University administration as we move forward together to bring healing, reconciliation, and unity to the Andrews University campus. We recognize that the campaign fueled a myriad of thoughts, sentiments, and responses—we also understand that there is a spectrum of emotions associated with both #ItIsTime videos. From the confused and offended to the inspired and empowered, members of our campus community, and beyond, continue the difficult process of navigating opposing opinions; however, our team believes in our administration’s ability to lead all of us forward, and we support President Luxton’s vision for gospel-centered reconciliation. As an institution, Andrews University promotes three core tenets: seek knowledge, affirm faith, and change the world. It aims to infuse the love of Jesus into our pursuit of knowledge, faith, and social change. Our administration has attempted to reinforce these goals with its emphasis on stories and inclusion. As we “learn to do what is good. Seek justice. Correct the oppressor. Defend the rights of the fatherless, [and] plead the widow’s cause,” we will also learn to value the stories of all God’s children, becoming advocates for the less fortunate and disenfranchised (Isaiah 1:17 HCSB). It is from this ethos that #ItIsTimeAU was birthed, and it is with these same values that the message and plea of the #ItIsTimeAU video was received by our administration. The goal of the students and staff behind the video and the goal of our administration are one in the same. We all seek to make our Andrews community—and our world—a better place. We have full confidence in the sincerity and ability of our administration to do as they have promised. We hope that the larger Adventist community will join us in supporting Andrews University. Though we feel we have reached our goal as an #ItIsTimeAU team (i.e. to amplify the voices of those who have not felt authentically heard or valued), we hope that the conversation does not end here. We encourage our wider, denominational community to engage the discussion on race relations within the Adventist church. Andrews University has set a beautiful model for how to begin this journey, and it has also accepted the daunting invitation to tread the tumultuous terrain of genuine reconciliation. We hope other Adventist institutions also move towards opening the door for such reconciliation to take place. We are forever grateful for the Christ-inspired leadership we have seen during this experience, and we eagerly look forward to assisting our administration in building a brave new future. On April 6, 2017, the staff of Meier Hall responded to these words; the words which President Luxton chose to begin her chapel address to an Andrews community that was hurting and discouraged. They were not spoken to minimize, placate or pacify; rather, they were spoken as a call to take courageous steps in a journey toward ultimate healing and inclusion. In a visit to the president’s office, resident advisors, student deans and deans committed to reacting less and listening more, bringing those on the margins into the center and searching for any chance to lift up those in need. In their Instagram post about the visit, Meier Hall staff asked, "In a world that believes its best times are behind it, what will you do to ensure that #wewillbeok?" Thursday, Feb. 23, 7 p.m. Please text your questions to 269-281-4383. This student forum offers the opportunity for Andrews students to engage directly with President Luxton and Provost Arthur on concerns expressed in the #ItIsTimeAU video. Sunday, Feb. 26, 8 p.m. This session will focus on helping participants think about the limitations they bring into the conversation about race. These limitations include: limited knowledge, limited understanding of one’s own emotions and an “all” or “nothing” binary on the definition of racism that largely leaves racism unchallenged. Finally, we will provide three actionable steps that participants can take today to have better conversations about race and racism. Thursday, March 2, 8 p.m.
Tuesday, March 7, 11:30 a.m.
We understand that not one person alive today took part in the invention of race and racism. We also acknowledge that it is the inherited responsibility of this generation to examine and respond to ways that we keep it alive. This session provides context for the fight for racial justice by people of color and provides evidence of why racial justice today is not about slavery but about current events. We will trace the journey of “race” from the 1600s to today through the fabric of our American foundation. We believe we can tell the truth, advocate for personal responsibility, and provide a safe, non-judgmental atmosphere for racial reconciliation. The following message was sent via email to Andrews University faculty, staff and students on Monday, Feb. 20, 2017. I trust many of you are experiencing some of the rest and restoration that can come with a three-day weekend. I, along with our provost, Christon Arthur, wanted to write to you this evening, even before school resumes tomorrow, since I imagine many of you may have heard about or watched the #ItIsTimeAU video released over this past weekend. This letter is far longer than usual, but it regards something that is at the heart of our Andrews University community and the students, faculty and staff we serve. I invite you to take the time to prayerfully read and reflect on these words. The #ItIsTimeAU video has struck a chord with many on this campus and beyond, and inspired a variety of passionate reactions from all corners, both on this campus and far beyond. In its first two days, more than 120,000 have watched the video on Facebook and listened to the concerns and expectations the video contains. I wanted to share with you some of the ways in which Andrews seeks to respond to the questions and concerns of the video, and the realities and challenges of our diverse campus community. This community includes our African-American students who have often faced, and still face, systemic injustices and racism that significantly compromise their journey as part of this campus, church and global community. Some responses to those concerns (both raised in the video and within our overall campus community) have been explored, and need to be fully and clearly articulated, with measurable next steps. I don’t know if you had a chance to hear or read it before, but I spoke last October 1 at the “Journey to Healing and Understanding” event held in Berrien Springs in conjunction with the Lake Union Conference of Seventh-day Adventists (you can watch a video here). In my talk that day, I reflected on some of the issues, challenges and apologies sought and needed in connection with our incomplete journey as a university as it relates to our African-American community. “As an organization we have been guilty of racial bias, of making African-American employees and students feel ‘less than.’ We have not listened well. We have not been sensitive and have not taken action when action should have been taken. For that I am profoundly sorry. It is not good enough for us to see ourselves simply mirroring or being the victim of the challenges and conflicts of society at our point in history. As Christians, as Seventh-day Adventists, we must always have greater expectations of ourselves. We never have an excuse to devalue, make assumptions of another because of their race. We have no excuse not to be open to understanding our own sinfulness and bias as we ask God to ‘search us and see if there is any wickedness in us’ as the Psalmist expresses it. I, Dr. Arthur and the entire Andrews University community seeks to take and respond seriously to concerns like these at a school and within a community where God’s kingdom and His children are present, and the injustices of the past and present must continue to be understood and addressed. As we respond, I invite you to join me at Undergraduate Chapel this Thursday at 11:30 a.m., either in person at Pioneer Memorial Church, or online at andrews.edu/livestream. There is an opportunity for the faculty and staff community to meet and talk about these issues tomorrow, Feb. 21, at 4 p.m. in Garber Auditorium, Chan Shun Hall. We are also planning a student forum along with other opportunities for student conversations later this week and beyond. As appropriate, you’ll hear more about those meetings directly from our provost and Student Life team. These are essential conversations for our community. Many other conversations, directly and with civility and respect, will need to ensue beyond our time together this week. We invite your prayers and participation as we continue to seek to understand the pain that our African-American community has experienced and is experiencing, along with others throughout our community and world. In the end, I am confident and pray that we will emerge from this current situation, a stronger, richer and better University. This is an opportunity for soul-searching and reflection—both corporately and individually. The following message was sent via email to Andrews University faculty, staff and students on Tuesday, Feb. 21, 2017. There has been much heart-searching this week as our campus has processed the #ItIsTimeAU video. A suggestion at today's faculty and staff forum in response to the message of this video is a good one. In addition to Dr. Luxton’s invitation to join her at chapel on Thursday for our continuing conversation, we would like to invite us all to set aside a day this week for fasting and prayer (7 p.m. Wednesday to 7 p.m. Thursday). Let us join together in seeking God for the guidance and wisdom, the correction and healing we need—so that we as a campus might reflect to the nation and world a portrait of His loving character. The purpose for a day of fasting and prayer isn’t to impress God with our self-denial, but rather to remind ourselves of our earnest need for His healing grace and enabling wisdom. We believe the same Christ who calls us to “‘love one another as I have loved you’” (John 13:34) will lead us to the healing and unity we personally and collectively seek in answer to His prayer, “‘That they all may be one as You, Father, are in Me, and I in You—that they also may be one in Us, that the world may believe that You sent Me’” (John 17:21). The following message was sent to the Seminary faculty, staff and students on Wednesday, Feb. 22, 2017. We feel the pain and frustration expressed in the #ItsTimeAU video put out this week and applaud the courage of the students who spoke up. Long-time structural challenges tend to become invisible and it often takes repeated and painful expressions before they can be fully addressed and dealt with. We appreciate the work that Dr. Luxton began last fall in her apology on behalf of the institution at the Lake Union “Let’s Talk” gathering here in Berrien Springs. We look forward to this apology being communicated more directly on campus and for further steps to be taken. We at the seminary also want to continue moving forward with the work we have done with Dr. Moskala’s institutional apology on April 7, 2015, with the push for greater recruiting and hiring of African-American faculty which is now beginning to bear fruit, and with the plans of our newly re-formed Seminary Committee on Ethnocentrism, Racism and Social Justice. We are grateful for the suggestions made by students in our recent forums and look forward to putting more into place soon. We welcome the suggestion of a manifesto for moving forward without delay, including diversity training for faculty and staff. Let’s join Andrews University faculty and staff for a day of fasting and prayer that our gracious and loving Lord can bring better understanding, forgiveness, healing, reconciliation, and right actions.